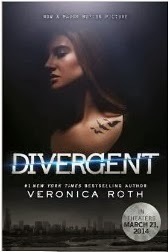 Click to buy Divergent or read other reviews! Brief synopsis: Tris lives in a society that has been forced into five factions: Abnegation, Dauntless, Erudite, Candor and Amity, in order to prevent the continued demise of their society from selfishness and over indulgence. She along with every other 16-year-old must perform aptitude tests which will help them choose the faction they belong to for life. Sometimes it’s the same as the faction their family belongs to...and sometimes it isn’t. From the very beginning Beatrice (Tris) is faced with difficult situations-choosing her family and a faction where she feels like a misfit, or choosing a different faction where she is a stranger, but believes in her heart she was born to be a part of. Then wondering if she has made a terrible mistake when she begins to learn more and more about the motives of her new faction, but you can never go back. The ride is fast and doesn’t really ever stop, especially after they enter level two of their training. Roth did a fantastic job of creating scene after scene that made me hold my breath...literally, and you know where I’m referring! NO SPOILERS! Originality: I can’t say that Divergent is a highly original concept, as there are so many YA books with strong females and kids being trained for violent times at the moment BUT I do love this genre (obviously, I write in it) and was highly entertained with the story and how it was put together. Each turn was something new and different as the story unfolded and you never knew where it was going to take you. I felt like there was also more complexity in Divergent, than some of the other YA novels in the various relationships with Tris. Her friendship with Al, Christina and Will and how those morphed throughout the story. Her frustrating interest in Four and her journey into a world unknown-love. The guilt she carried for not choosing her family and the secrets she would eventually find out. There was a lot of stuff going on! Characters: I like the depth of the character of Tris. It becomes very obvious as you get to know her that she never could have remained as Abnegation. She is actually quite cold-hearted and very quick to wish her enemies might stop breathing. She also results to thoughts of violence quickly when things are going wrong-which can only be Dauntless. I appreciate the fact that Tris is independent and strong like Katniss, not a damsel in distress waiting to be saved...or turned into a vampire (sorry Bella). I enjoyed the way Roth developed the relationship between Tris and Four, the Dauntless trainer, letting it grow and intensify throughout the entire story to deliver such an intense moment when Tris must confront Four back at the Dauntless headquarters. She rushes to try to save their society from crumbling under anti-government war, but Four isn’t himself and stands in her way. She is forced with another tough dilemma-kill or be killed. Recommendation: This book goes well with Junior Mints and a large Cherry Coke because you won’t be able to pay attention to what your eating and you might make a mess! You’ll want the large because you won’t want to get up for a refill. p.s. If you like this blog post, please click the +1 button just below here, so others may find it, too! HI Lance! I have you entered in the drawing for Quest of the Hybrid! Here is the link to Crash Landing where you can download a digital copy for free! http://www.smashwords.com/books/view/410826. I love this book! I read it atleast 3 times. Have you started Insurgent yet? Hi Gina! I'm going to wait to read Insurgent until after I see the movie - less than 2 weeks away!